The Mentat system is a platform enabling to unify the collation and subsequent processing and managing of various detected security events coming from a wide range of different detection systems. It was designed to aid CSIRT security team to process and manage huge amount of security information for the backbone network size. Mentat is designed as a distributed modular system with the emphasis on security, extendability and scalability. The core of the system is implemented similarly to the Postfix MTA. It consists of many simple modules (or daemons), each of is responsible for performing a particular simple task. This approach enables smooth process-level parallelization, configurability and extendability. Mentat itself does not have any network communication protocol for receiving events or messages from the outside (however nothing stops you from implementing your own module). Instead it relies on the services of Warden system, which is the security information sharing platform. All modules use the same custom core framework called PyZenKit, which makes implementing new modules an easy task. The implementation language is strictly Python3 with no attempts whatsoever to be compatible with Python2. 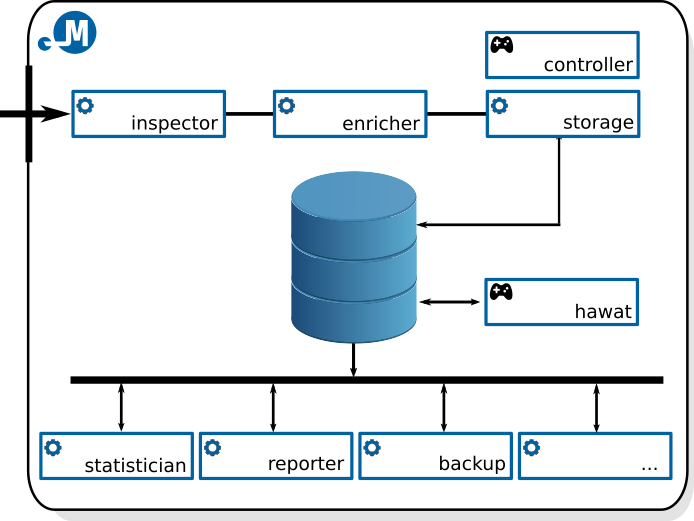 The system uses the PostgreSQL database as persistent data storage. The system uses the IDEA as data model, which is based on JSON. It was specifically designed to describe and contain a wide range of different security events and with further extendability in mind. The diagram below provides an overview of the existing architecture of the Mentat system. You can find full list of real-time message processing modules in appropriate documentation section. You can find full list of message post-processing modules in appropriate documentation section. You can find full list of utility and management modules in appropriate documentation section. Configuration loading, merging and validation. Abstract layer for working with IDEA messages. Work in progress, soory for the inconvenience. All continuously running deamons operate as pipes, i.e. the message enters on one side, the module performs relevant operations and the message reappears on the other side. To facilitate message exchange between individual deamons, alike in Postfix MTA, the message queues are implemented by means of simple files and filesystem directories (see appropriate subsection below for more details). Internally the daemon modules use the event driven design. 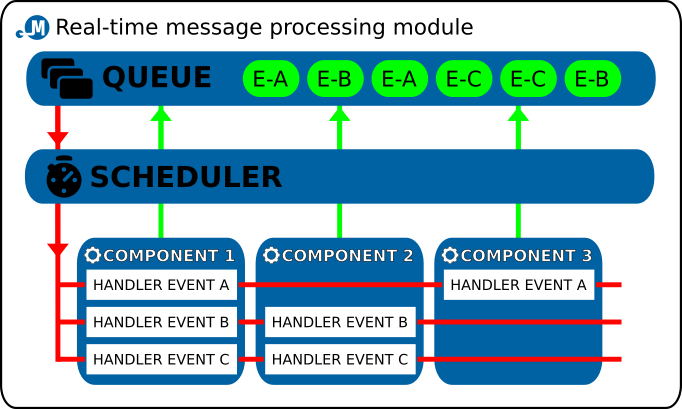 There is the infinite event loop and events are being emited from different parts of the application and then are ordered into event queue. Scheduler takes care of fetching next event to be handled and is reponsible for calling appropriate chained list of registered event handlers. To further improve code reusability each of the daemon modules is composed of one or more components, which are the actual workers in this scenario, the enveloping daemon module serves mostly as a container. There are different components for different smaller tasks like fetching new message from filesystem queue, parsing the message into object, filtering the message according to given set of rules etc. These components can be chained together to achive desired final processing result. So, when implementing a new deamon, one only needs to design and implement the actual processing; everything else is provided for automatically, including the selection of a message from the queue and subsequent upload into the queue of another daemon in the processing chain. To facilitate message exchange between daemon modules a very simple filesystem-based message exchange protocol (aka. filer protocol) was designed and implemented. It is inspired again by Postfix MTA. Blue arrows are filesystem operations performed by the external process, that is placing new message into the queue. It is clear, that according to the procedure described above the message is first placed into the tmp and then atomically moved into incoming. Red arrows indicate filesystem operations performed by the daemon process itself. By atomically moving the message from incoming to pending it marks the message as in progress and may now begin the processing. When done, the message may be moved to the queue of another daemon module, moved to the errors in case of any problems or even deleted permanently (in case the daemon module is last in message processing chain). The atomic move operation from incoming to pending serves also another purpose, which is locking. When multiple instances of the same daemon module work with the same queue the atomicity of the move operation makes sure that each message will be processed only once. All daemon modules are prepared for this eventuality and are not concerned when messages magically disappear from the queue. The web interface for Mentat system is called Hawat: Web user interface and it is built on top of the great Flask microframework. However the micro in the name means, that to make things more manageable and easier a suite of custom tools had to be implemented to enable better interface component integration. Flask already provides means for separating big applications into modules by the blueprint mechanism. This is used very extensively and almost everything in the web interface is a pluggable blueprint.